Athens has long been a hotbed for up-and-coming musicians. Having churned out artists such as R.E.M and the B-52s, and more recently The Whigs, the Classic City has a reputation steeped in musical excellence. But despite the city’s proud musical background, Athens has one major problem that plagues musicians throughout the city. Despite the music culture, bands often find it hard to get significant exposure outside of playing shows. Save the odd press clipping, many bands and musicians find MySpace and PureVolume Web pages the extent of marketing and public relations campaigns. With over 500 bands in the Athens area, it’s easy to get lost in the shuffle. And add in the fact that many musicians are college students that have little time to devote to marketing and exposure of their bands. So wouldn’t it be cool if local musicians could gain exposure through a TV series featured on a multi-channel interface? That is exactly what Listen Up Local aims to do. Listen Up Local’s TV series could be disseminated through a traditional television format, as well as on computers and smart phones. So what does Listen Up Local mean to you? 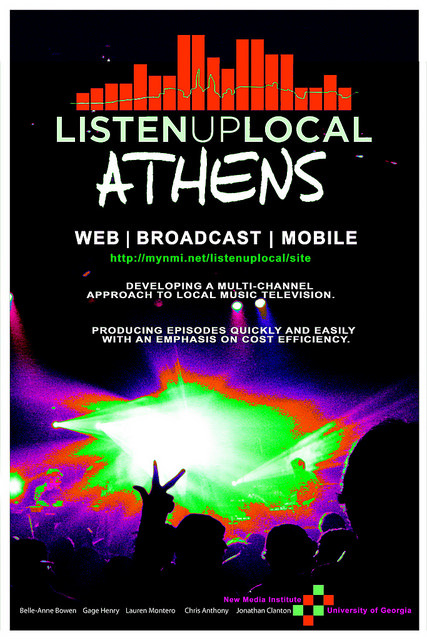 It is a multi-channel program aimed at bringing you the latest songs, music, and information from bands around Athens. Produced in two hours or less, these ten two-minute episodes give you a new look into the Athens music scene.